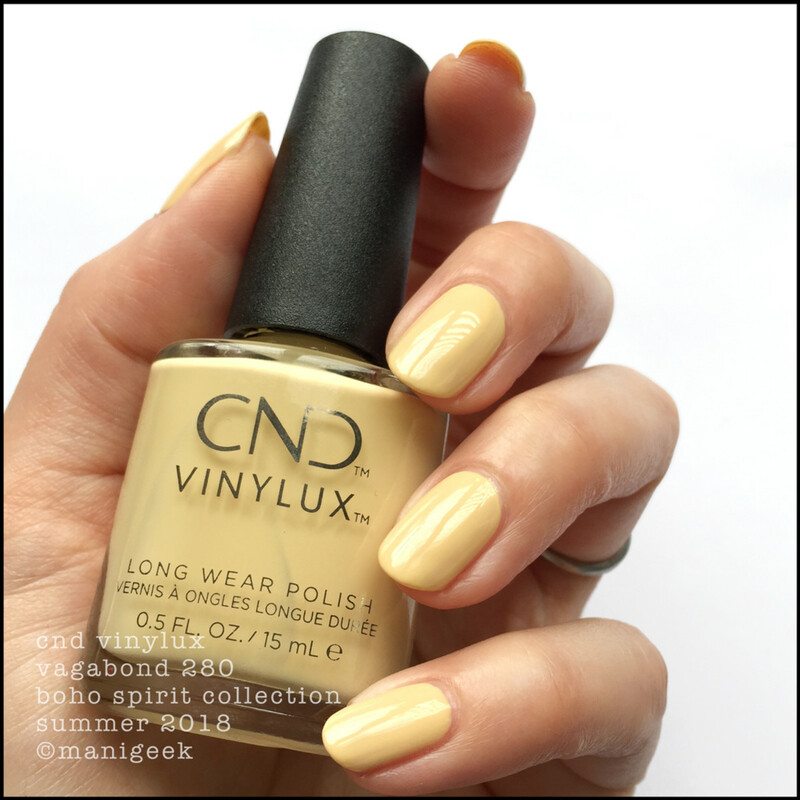 CND Vagabond 280 – Boho Spirit Summer 2018 (above). Let me start here because this is what I started with. My notes say “What the hell kind of magic is even in this formula? It’s like buttah! 2 coats.” It’s also a most interesting shade of Dijon that somehow looks insanely sophisticated for being a shade of mustard. And 2 coats? Seriously, what the heck?? This brush. This formula. This polish. I can’t even. 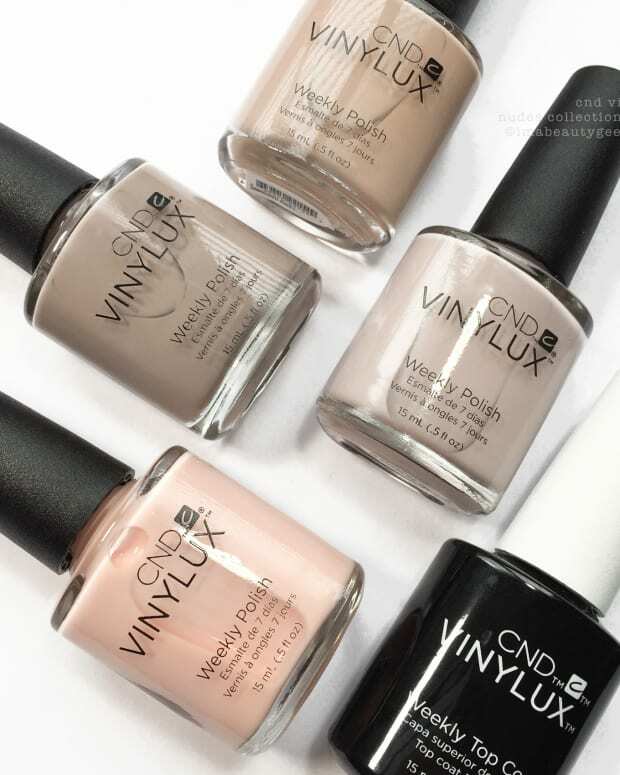 If you haven’t been following our coverage of CND Vinylux, you haven’t heard there’s a new brush. There, now you’re all caught up. 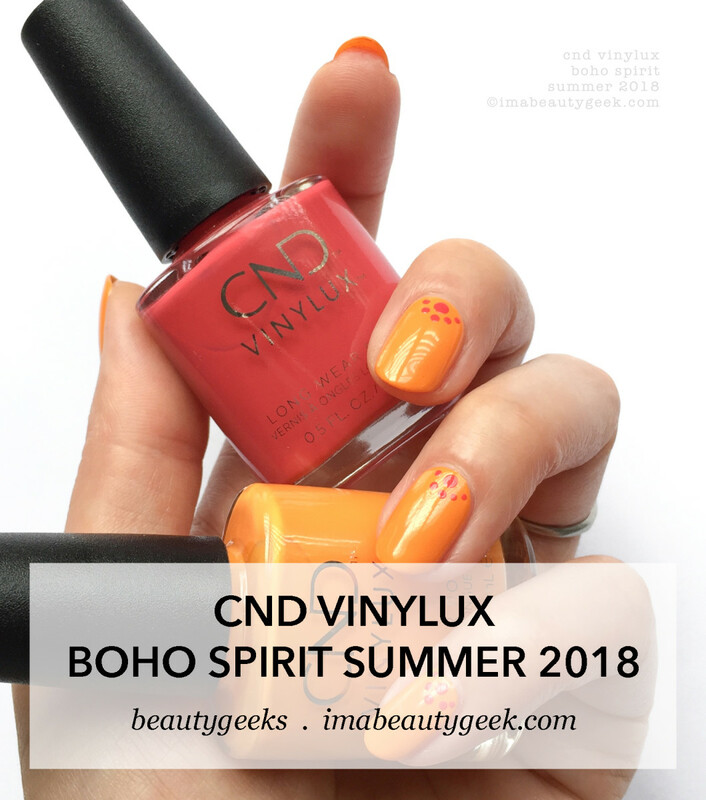 CND Vinylux Uninhibited 279 – Boho Spirit Summer 2018 (above). I’m going to quote my notes again so you get a real sense of my immediate response to this bottle: “Seriously. 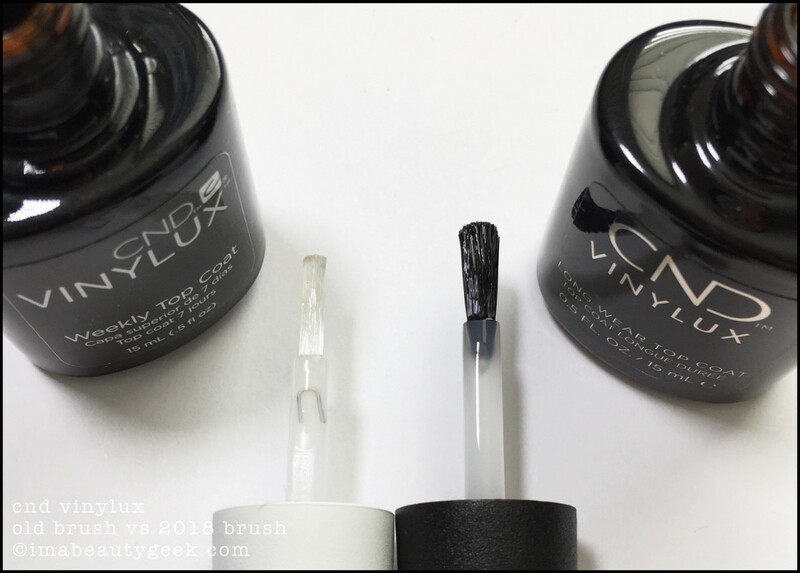 This formula/brush combo = best in forever. What joy! What happy! What amaze!” Apparently, this bottle of Vinylux made excitement. So much excitement that I forgot to write that it’s 2 how-is-it-possible-painting-can-be-this-easy? coats. 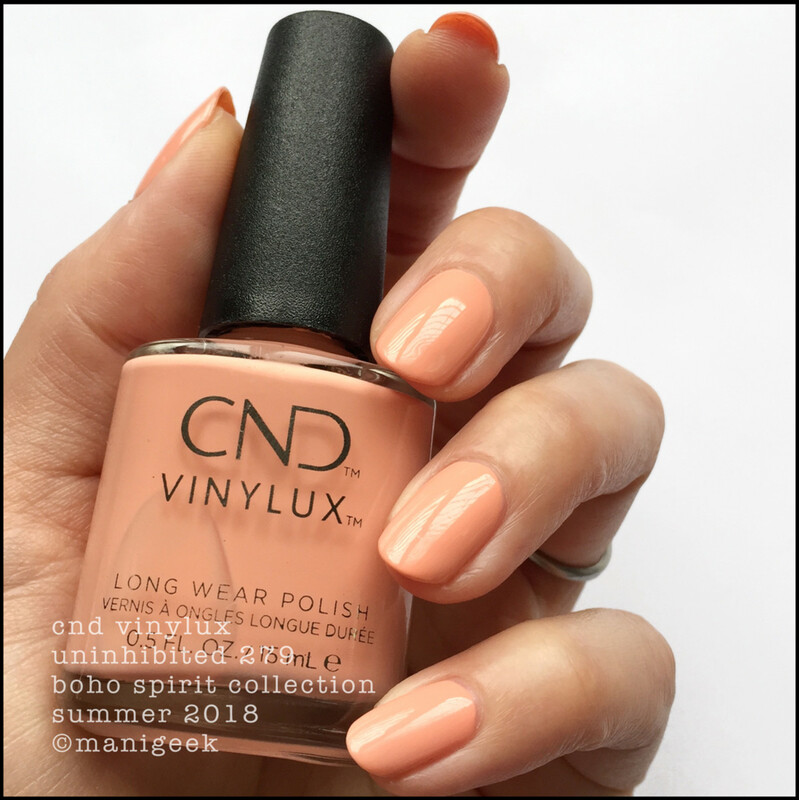 CND Gypsy 281 – Boho Spirit Summer 2018 (above). Gah! Lookit dat orange! 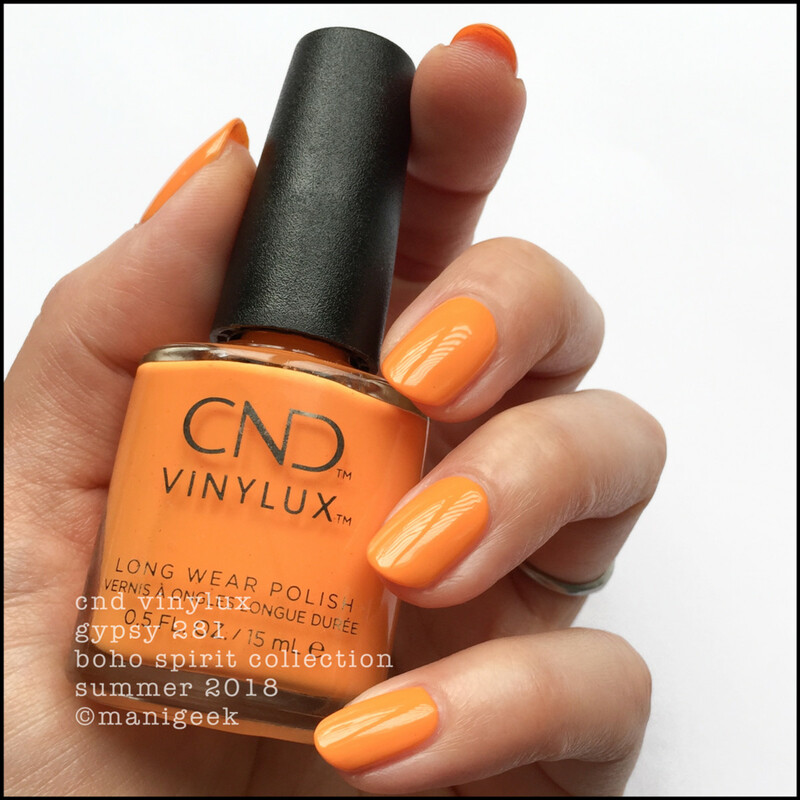 It’s like a saturated Creamsicle and I love.love.love it! It IS 3 coats though, but here’s the kicker – the 3 coats went on in the time it usually takes me to do 2 coats of everything else. I don’t get how this is possible. It blows my mind. Nick says, “It’s not magic, it’s the voodoo that youdoo”. 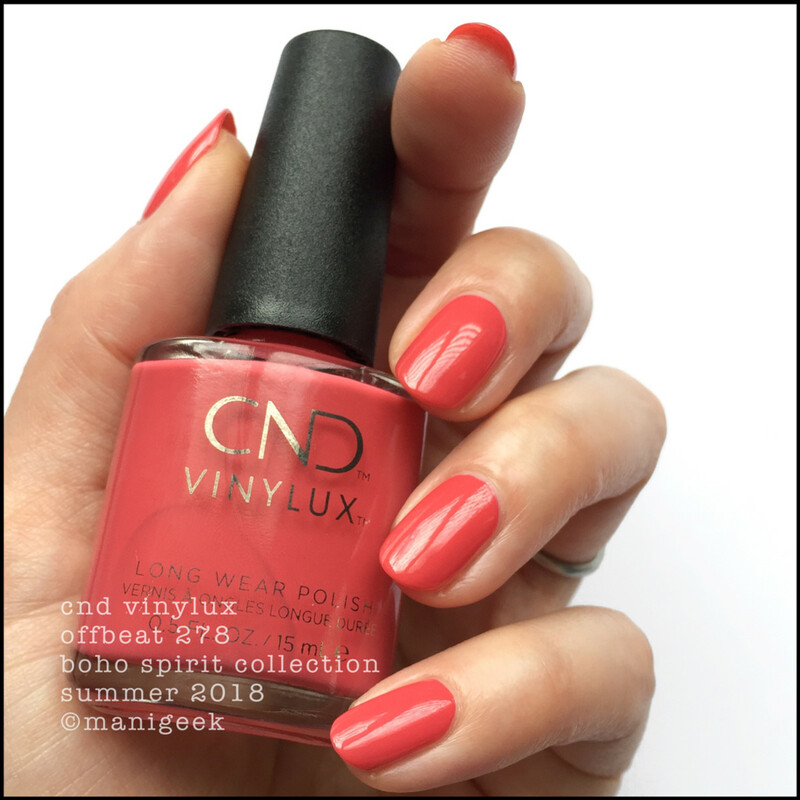 So what do I really think about this 4-shade CND Vinylux Boho Spirit collection? Um, A+. I mean it’s only the best collection I’ve swatched in like… forever. 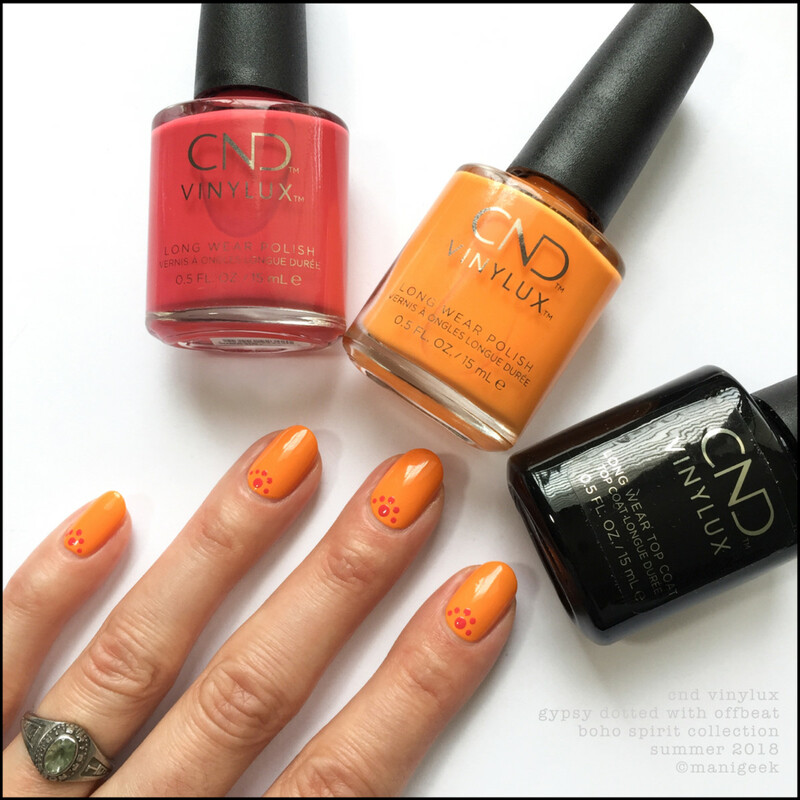 If you&apos;re looking for a summer polish with a brush/formula combo that paints itself on, Boho Spirit is everything. This right here feels like an intensely purposeful collection: it&apos;s compact, it&apos;s complimentary, and wickedly succinct. 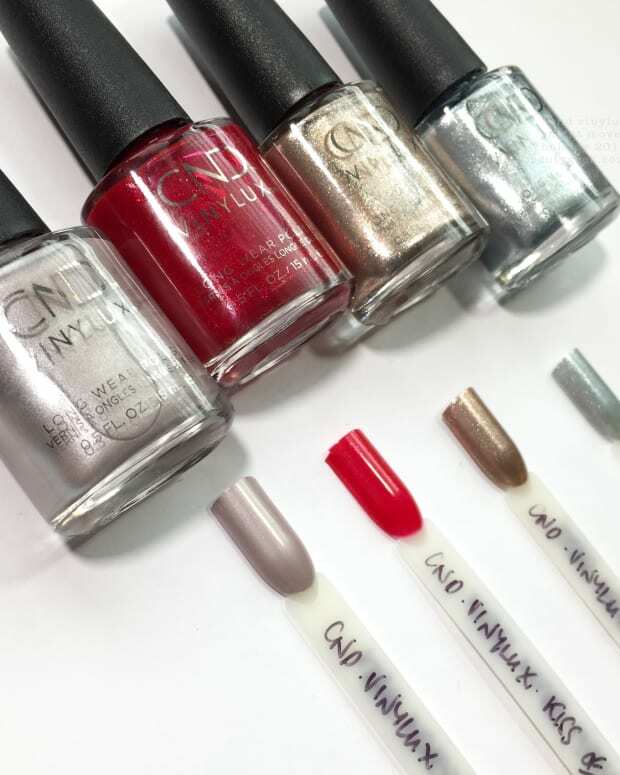 It&apos;s like CND said, “We’re making this flawless summer collection and we’re not throwing 11 bottles of extra junk in there (yes, OPI, I&apos;m looking at you) because we 100% know that we&apos;ve nailed it." Every polish company out there should take notes. 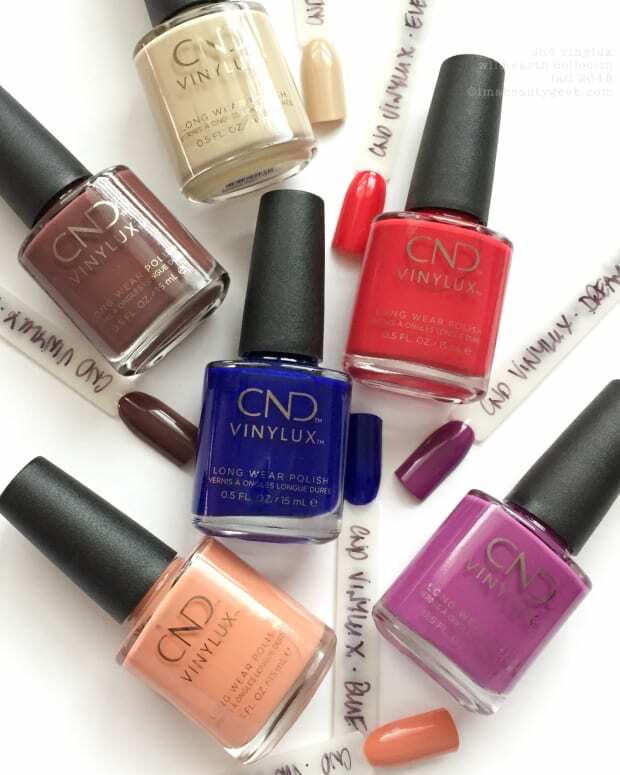 The future of mainstream should be this: quality polishes in collections that are short, sweet, and to the point. So yes, A+ for pure joy. Now I really, really, really can&apos;t wait to see their next collection - I hope it&apos;s exactly the same kind of greatness as this one. Manis & photos karen falcon (she’s very proud of her arting).